Welcome to the plumbing register by Martin Smith who is gas safe & works as an agent. Martin Smith runs a nation service providing customers with an 24 hour emergency plumbing service nation wide. Our system includes a very clever Emergency Plumber App that tells us if your ON/OFF call. For any future visits to this page, please keep a note of this link www.plumbingregister.info – Please read all below to understand what we are all about & how it works. To the right is where you sign up to the plumbing register, but before you do this, it’s important you read this page before, to have a full understanding of how this works. It’s important that all work you receive on an emergency & non emergency plumbing basis is paid directly to you by either the customer or an insurance company depending on who has authorised the work. Before you decide to register your details, we would appreciated it if you have a read the below and then register your detail so that you fully understand the process for when a customer calls out an emergency plumber. When downloading the emergency plumber app you will need to visit the app store and type in ‘Emergency Plumber’ just below is the image that will help you download and activate your account. What are the plumbing/gas rates of payment on completion? To the right of you are the plumbing register labour rates. This is what the customer will pay you on completion unless the work is passed to you by an insurance company. It is an idea to either save this image to keep for any future records or we will always remind you of the rates in every text or email we send with the job details. What happens if we get a general plumbing job, which we have quoted for or any further work from the customer from the plumbing register? Once you have completed the plumbing job from the plumbing register, you MUST give the customer and invoice/receipt on payment or before. Remember, you’r responsible for your own work, so this means your contact details should be left on the invoice with proof that the customer has received them. Any further work from the customer you MUST let us know & a 10% of the labour cost fee that you will need to pay us. Please take a note that we have had emergency plumbers & gas engineer in the past that hide the fact that they have had any further work from the customer. What happens if we do further work and not pay the 10%? If you want to be the first on call in your area for plumbing emergencies, then you will pay the 10%. If you are found to not paying the 10% and you have been hiding the work to make more money, then we take this has a serious problem, however, we will still keep you on our database, but if you want to be on first call or on rotation with other engineers, then you will have to pay a fee of 30% to clear your bad debt account, otherwise you will be at the back of the list on our plumbing register. Why do we have to pay 10% for further work we get from the plumbing register? The reason we take 10% for any further work is to build up the extra advertising for the engineers in the area to produce more work which is not classed as a earning to the plumbing register of Martin Smith. It is solely for the plumber to gain extra work and for our company to be more competitive with other national companies. 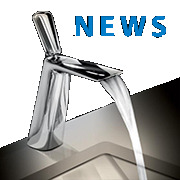 What happens if the customer cancels well on route to the plumbing emergency? If the customer cancels with 10-minutes of the plumbing emergency going out, then this will be classed as unfortunate. 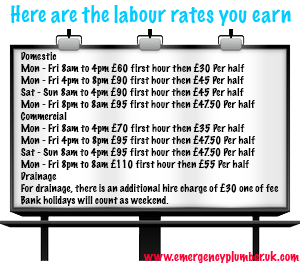 After 10-minutes & your on route to the plumbing emergency, we will pay you an inconvenience fee of £30. What is the time frame from when the customer books for an emergency plumber? The time frame from when the customer books the emergency call-out is 30 to 90-minute unless stated otherwise. What should we do when on arrival to the plumbing emergency? For the terms and conditions to protect yourself when on arrival at property, it is up to the emergency plumber to get a signature of the time of arrival, include the hourly rates on the invoice. It is very important to include the time, engineers name and contact details. If any materials are used with the authorisation of the customer, then there must be a break down. You must include the time on site, just incase this was to be questioned at a later date. Once work has been completed, it is very important to get the invoice signed and paid for on completion. Please note: On completion/temporary work, don’t forget to give the customer an invoice. If the customer is charged too much, then this must be dealt with immediate and may result in temporary or permanent suspension in passing any further work from the plumbing register. If being suspended from our register, there will be no work passed for a minimum of 1-month, which you will need to re-register in the plumbing register. As an agent, Martin Smith works on protecting the customers rights, but also includes the engineer rights who may attend. If the plumbing/gas engineer does not get to the property within the time window of the 90 minutes, then the plumbing/gas engineer will loose there rights to the job, which may result in cancellation, as our company has to respond in the best interests of the customer. If a customer was to give information of cancellation to the engineer in question, this MUST be done by text. If any work has been done temporary, then this must be written on the receipt/invoice. All emergency plumbers must have all the correct tools and materials as stated in the emergency plumbing stock list. When registering your details on our plumbing register, you may find that other companies may also get your details, such as concept solutions. We would like to remind you that anyone taking cash and not giving any receipts in return will be taken off the plumbing register. As a plumbing agent we work on good recommendations, if there is any foul play or we feel that the customer is not being treated in the way the customer should be treated and in a professional manner, then again, you will be taken of the plumbing register. If you have an android phone, click here for the emergency plumber app. 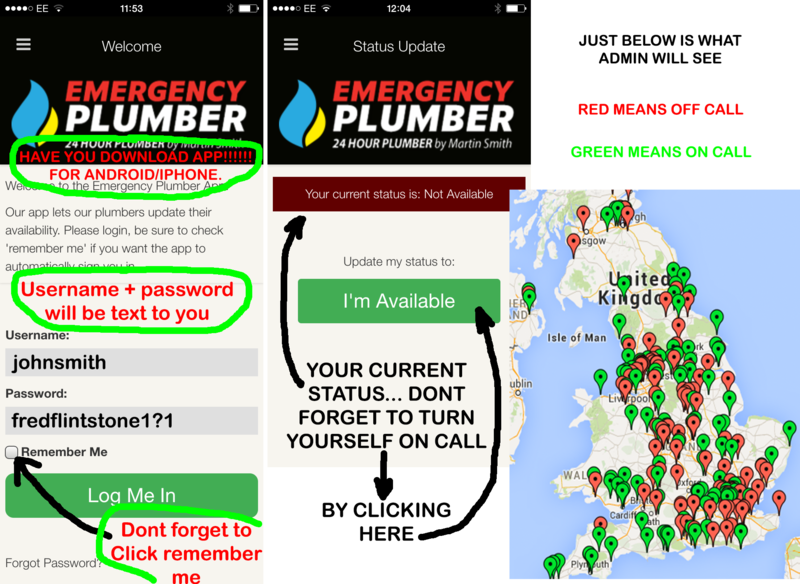 If you have an Iphone then click here for the emergency plumber app. Once you have download the emergency plumber app onto your phone, you will be asked for the user name and password, if you don’t have this then click on the forgotten password and it will be sent to the email address you registered with us. It is always a good idea to check your junk mail as it sometimes lands in there. You can also contact Martin Smith and ask him to tell you your user name and put in a password if this makes it easier for you. When signing in to the emergency plumber app, don’t forget to click on the ‘don’t forget my password box‘ this will help you stay logged in for at least a year and all it takes is 2-seconds to log in automatically. Once you in the emergency plumber app, you can turn yourself off/on call as many times as you want. Soon we will have plenty of other exciting stuff such as a plumbing shop and more. If you can think of anything else we can add to the emergency plumbing register then please let us know.